My first thought when I looked at the very first picture was that the size of each lane seemed to be the same size as is standard in Denmark (Which is probably smaller than in the Netherlands, but I am not sure about that) and that it therefore was good, and the separation level seem to be the same as in Denmark too. When looking at the rest of the pictures, I do agree with your points though. You're right, this scheme is a complete joke and makes a laughing stock of any ambition London might have to become a cycling city. Worth bearing in mind is the fact that London is much more densely built-up than many European cities, with far narrower streets even out into the suburbs, which makes the implementation of wide segregated cycle lanes difficult. Given that, however, I'd rather they either invested this funding in providing one cycle route of a high standard, or just didn't bother. This is a huge amount of publicity for almost no actual gain. Feather in the cap politics. We have that here. How can we make it look like we're being progressive without impinging on the motorists "right of way!"? I must that what you have pictured is better than what we ended up with. I do agree with your attitude. Push for exactly what you need. No point in starting out with compromises because you'll only end up with the scraps. I hope Obama is learning that lesson. 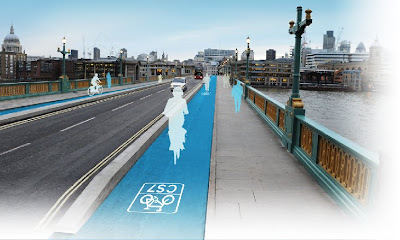 If this is what London has planned for the future, there is going to be no future in cycling safely there. Very disappointing. We have a similar situation here in Australia, except green paint is the order of the day. I watched the video of the cyclist being cut-off twice by that bus and I must say that made my pulse race — from fear. Disgusting. I hope that further action was taken against that bus driver. It was the equivalent of waving a loaded gun in the cyclist's face. Just awful behaviour. The Superficial Cycleways are already a standing joke in London cycling circles, universally regarded as a "failed project". The usual obstacles, I'm afraid: craven submission to car culture, and anti-cycling residents. Take that second pic, for instance - the one with the 90-degree bend you point out. 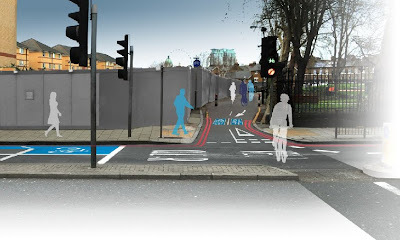 The sensible, fast, logical, safe, quiet route - the one we campaigned about for several years - goes straight across (the way the ghost cyclist on the right of the picture is going). But to do this needs a cycle path through a pedestrianised housing estate. There's loads of room - it's an empty paved area the size of a football pitch - but the residents say no because of "pavement cycling yobs". So councillors say no, too. 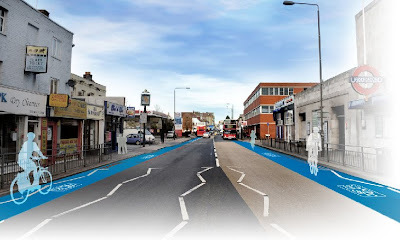 So no quiet, safe cycle path - instead, a 90-degree bend and another blue-paint swindle. I love the one with the narrow cycle tracks and 3 lanes for cars. If the graphic artists who created this view were able to only show the drivers/persons inside the cars it immediately became obvious how much out of proportion this huge amount of car space is. @David: my thoughts exactly and it's what I was afraid of from the get go. @Anon: London is NOT exceptional in density, that's a myth and an excuse used often. The Netherlands has towns and cities FAR denser than London and still it was made possible to allow so many modes of traffic (tram, bus, car, parking, bicycles, peds). Amsterdam would be just one good example. Thing is, it's all about really understanding how to have all these modes 'work together', in an integral way. Like David points out, you can't just slap an inadequate blue lane on a street without dealing with the rest of that street's grid. Making it appear like Copenhagen doesn't mean it is. Far from it. Freewheeler can tell you a thing or two about that, too. A city that takes cycling seriously needs to have the political will (balls = knowing what you're doing, based on facts) to change the status quo and deal with safe segregation and integration of all traffic modes, set priorities and base further steps on those. Not skip over that, implement cosmetic changes and hope people will buy it. People who drive will, because they are exempt. People who cycle won't, because they will continue to feel unsafe and marginalized. 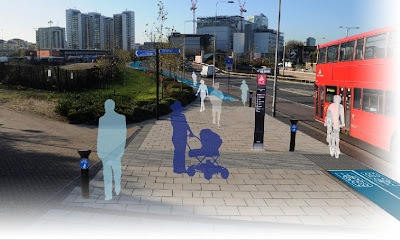 This does seem to be the project for 'really bad design renderings': every single image that TfL have so far released looks like a school project. This is a marketing campaign, nothing more, nothing less. 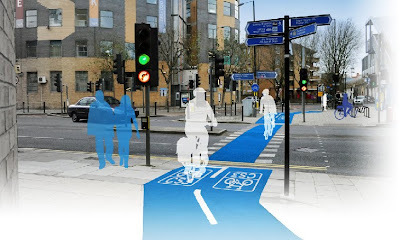 Most of these cycle 'lanes' exist already and are just being painted blue. Will it make motorists more aware of their existence? Maybe. Will it bring about a revolution in cycling levels? Hardly. Outside of the circle of 'cycling bloggers' I'm sure that some people will be duped and think these are marvelous, and it MIGHT encourage them to cycle more (subjective safety here David) but for those in the know this is a pretty pathetic attempt, and in places pretty reprehensible in terms of good street design. The sad thing is, this could have been a really GREAT project, but, well, the first 2 'superhighways' are just a bit crap really aren't they? It is clear that space is not to be taken from the motorised traffic. Some roads in London are six lanes wide which means we can have decent and fair space allocated to pedestrians and cyclists. Some explanation is needed as to why so much space is given to the motorist. One of the main design objectives should be to make a cycle route faster than the car route, which means nice direct lines and priority at junctions. Anonymous said: "Worth bearing in mind is the fact that London is much more densely built-up than many European cities, with far narrower streets even out into the suburbs, which makes the implementation of wide segregated cycle lanes difficult." This really is nonsense. I live in a suburb on the edge of London and the scope for cycling infrastructure on the Assen model definitely exists. There are major roads where very wide pavements have been used for car parking, leaving cyclists to pass along a narrow cycle lane, usually 1.5 metres wide, hemmed in by parked cars on one side (with the ever present danger of 'dooring') and close, overtaking lorries, vans, buses and cars on the other. The difficulties aren't technical but political. The default position of my local transport planners is that car parking is the number one priority. My local councillors don't dissent from this. With elections coming up the three main parties are keen to position themselves as friends of the motorist. 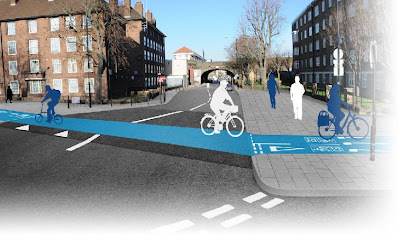 Cycling infrastructure in London is a cosmetic add-on, designed to create the impression that something is being done for cyclists. In reality few people want to cycle on roads which they understandably perceive as hostile, dangerous territory for cycling. I enjoy being out on my bike but it's never a truly relaxing experience, as I am constantly on the alert for danger. I'm intrigued that one commenter is shocked by the video of a cyclist being cut up by a bus. I think most cyclists in London would tell you that being cut-up by an overtaking vehicle is a very, very common experience. Yet another case of what we're really good at in the UK - taking things from Europe that seem to work, and deciding only to implement the window dressing elements of them. Bah! BTW - the cyclists in the pictures look like ghosts riding ghost bikes. Surely there's a subliminal message there somewhere? yep ok its not great, but its better than before and if it encourages cyclists then it makes thing safer just by increasing numbers. I really take your point its not as good as the high dutch standards, but lets bear a few things in mind. As you often rightly point out the dutch infrastructure was built up over 20-25 years, London is just getting started. Remember Greater Londons population is ~ the same size as all of Holland, so give em a few years eh? Also, while the street size thing is a myth the sheer scale of urban density and land value is different to that of Holland. Finally, its earlier days most people in the UK do believe that cars deserve more space than people, so it is a brave-ish step that will increase hostility towards cyclng. Lets be honest cycling in London is booming, facilities are increasing , its better now than it was and hopefully the improvement will continue. The something-is-better-than-nothing argument is a dangerous one. The narrow blue strip of tarmac can be viewed as a ghetto, a place for cyclists to be condemned to. This is especially true if cycling in that lane is not realistic, and let's face facts, it isn't. Motorists now have a valid reason for shouting at you when you're riding in the middle of the road (perhaps because you feel it's a lot less deadly than on the blue paint). This is why a lot of cyclists are still integrationalists: They don't want to give up their right to a large part of the road. I (as a segregationist/integrationist hybrid-model proponent) think it's OK to give up my right to that large chunk of asphalt, but only if I get something better in return (i.e. a small chunk of asphalt that is nicer, safer, more spacious and car free.). The London cycle lanes tend to be narrower, deadlier and have more parked cars and other debris on them than the road surface we're asked to surrender. That's just a lousy deal. Improving conditions for cyclists on major corridors by providing proper infrastructure is not at all the priority..
Cycledad: Is it booming ? Really ? The stats for the entire country don't show a rise in British cycling. J..: I exactly understand your point. When I lived in the UK and my local off road cycle facilities looked like this, I rode on the road too. Oldboy: I agree with you. It simply isn't reasonable to expect people to want their children to cycle in the conditions which exist right now, and it will remain unreasonable until the proposals, and conditions on the streets, improve an awful lot from what we've seen so far. 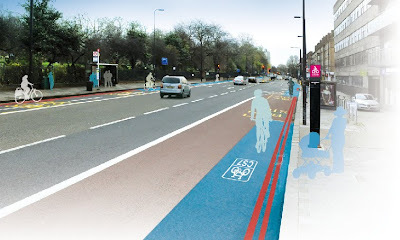 Cycling related road improvements in London?, and you believed them ?! London's roads are run by TFL and they would not profit from hoards of cyclists taking to them. They are far more interested in extending the congestion charge zone all the way to Heathrow so they can cream every bit of traffic from the airport to the city..
Cycling in London is booming, the stats show it and its pretty obvious when your on any street. Other govmt stats have shown rises in certain age groups and decreases in others.eg male 30-40yr olds is up , kids are down. This probably is a reflection of the road-only cycling model that we have in the Uk. There is a difference between the national picture and specific locations. What i see is that in areas where cycling makes sense there is an increase in cycling and i hope that these increases become self fulfilling in these areas. In areas with no critical mass there is no doubt a decline. This is my gut feel. As such you can go to London or Cambridge turn up somewhere on a bike and no-one thinks your weird. I'd rather have these hubs than a 1% national rise. Don't get me wrong i'd love it if we had dutch style paths all across the UK but we cant do that overnight. I don't think these cycle superhighways are great but i do think that overall they are an improvement. Extremely envious of the bicycle facilities over there. In Southend on Sea, Essex, we are getting a new cycle path that is two way and will only be 0.9m wide in each direction. Motor vehicles will be allowed to park right up to the lane and their doors will open onto the cycle path. The only seperation will be a raised white line! @blighty rider - that's very, very poor. If it's not too late you should point out that goes against the recommendations they are *supposed* to follow - Which I believe is minimum 1.5m, absolute min 1.2m for short sections. Not sure about door opening, but surely for a 2 way path that would fail a safety audit? 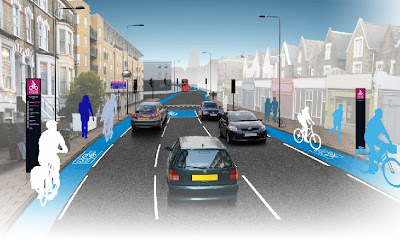 Sorry, but I have to disagree on the proposed superhighways being an improvement of any sort - not only are they mostly a recolouring of existing cycle lanes, but in some cases they promote extremely dangerous cycling practices (undertaking of traffic near junctions and on narrow roads, for example). 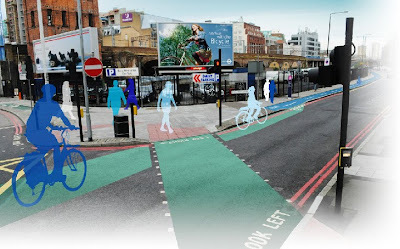 Add to that the fact that their more prominent colour is likely to encourage motorists to behave as if cyclists are meant to be cycling on the superhighways only, rather than being entitled to the entire width of the road. This can likely lead to motorists driving much more dangerously around cyclists, as well as raise the chances for aggressive behaviour against cyclists. I realize that the highways currently painted on are merely tests, but I would expect the tests at least to work as they are fully intended to, which they don't. The bit of the superhighway close to where I work is intermittent, badly planned and cuts off suddenly right before a pinch point, leaving cyclists using it dangerously exposed to vehicles merging onto a slightly narrower lane. I will echo the comments that the intentions are good, but good intentions are always only good intentions and not automatically improvements.